Plantation Shutters vs Roller Shades: Which are Best for Sunshine Coast Homes? TIMBERSHADESUncategorizedPlantation Shutters vs Roller Shades: Which are Best for Sunshine Coast Homes? If you’ve found this article, you’re probably wondering whether or not you should invest in plantation shutters or roller shades. One thing is for sure—if you live in the Sunshine Coast region, you need to upgrade from traditional blinds and curtains. But which upgrade should you choose? Both have their pros and cons, so we took a thorough look and came up with a verdict for you. Stylish, efficient, flexible—wooden window furnishings are vastly superior to your average curtains or blinds. And they pay back major dividends over time. We’ve compared roller shades and plantation shutters to see which ones win out…the choice is ultimately yours though! Plantation shutters: Are either made of wood or faux wood and fit on your window (either internally or externally). They are designed with wooden planks (called louvers) that can easily be adjusted for light and privacy. Roller shutters: Are also wooden shutters, but they lock onto your windows and roll down. They don’t open from the sides but rather slide down from their fixture to cover your window. Roller shutters come in a variety of styles and colours, but it’s hard to measure up to the style, grace, and decadence of plantation shutters. Their classic look allows them to seamlessly blend in with any style or decor, and they look great wide open or closed. Their flexible nature means they can come in more styles and colours than typical shutters, and their adjustable settings make them the perfect accessory for any home. With rising energy prices and more environmental awareness, Australian homeowners are searching for new and more creative ways to cool their homes. Shutters can lock over your windows, effectively blocking the sunlight and reflecting its UV rays. Both roller shutters and plantation shutters do a great job of keeping your home cool and your energy bills low, so this one is a draw! Roller shutters are very closely fitted to your windows. And, the fact that they roll upwards rather than opening outwards makes them extremely secure. However, the main advantage here is that they act as a deterrent. Would-be intruders don’t like the look of a fully closed off home with roller shutters. Plain and simple. Once they are locked in the closed position, there’s very little chance of getting in. That doesn’t mean that plantation shutters aren’t secure, too. It just means roller shutters are superior. The good news about both types of shutters is that they can completely block out the sun for maximum light control and privacy. 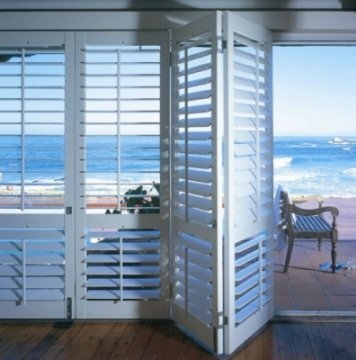 If we had to choose, we’d say plantation shutters are the superior option due to their flexibility and ease of control. In our opinion, they also look a lot better when compared directly. Even in the fully closed position, you can open the louvers fairly easily to let some extra sunlight in, and it still makes the home look stylish and sophisticated. When it comes to plantation shutters vs roller shutters for your Sunshine Coast home, you really can’t go wrong with either. However, plantation shutters are the superior option in our opinion. Their level of style, flexibility, and practicality can’t be matched by any other window furnishing. Contact Timber Shades today for your free design consultation and get the ball rolling on lower bills, more privacy, and greater style.